I love this time of year. My seed catalogues arrived last month and I’m making the final decisions on what to plant this season. I’m so full of anticipation. I can see in my minds eye the sun shining down on my garden overflowing with veg and herbs . I don’t see the mess in the garden left from the snow and a winter of neglect or the grey overcast sky. I can taste those first tomatos already, smell the basil and hear the ears of corn hissing on the barbecue. Of course with the last few summers so wet I didnt have quite the overflowing baskets of veg that I’d wanted, but hope springs eternal. 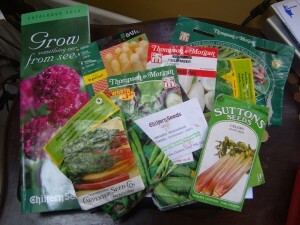 Heres a few things to think about when buying your seeds( vegetable and herb seed rather than flower and tree seed) . There are many, many seed companies out there. I try and go to privately owned seedsellers as they are more customer friendly. Many of the regular seed companies have been bought by giant chemical companies which aren’t so geared towards the customer. Unless specified otherwise most seeds available here are grown in mainland Europe . They are not at all adapted for our climate , neither the rainfall nor the temperatures. So try and buy seeds from smaller companies that grow the seeds in conditions similar to ours . The Organic Centre in Leitrim, Irish Seedsavers and Brown Envelope Seeds all stock Irish seeds. Try some heritage varieties of seed .They are often much more resistant to disease and have better flavour. F1 seed is expensive and not necessarily worth the money. Buy seeds for early varieties of plants if you are planting in an exposed area like a hillside . This gives a better chance of you getting a decent crop. I know its easier said than done but dont get carried away and buy a gazillion packets of seed . You’ll just feel bad when you can’t deal with them all. Make a plan. Do you really eat enough swedes to warrant planting a whole row of them?.I refuse to plant cauliflower anymore because I just don’t like it enough to bother. I never plant spinach either because swiss chard gives me my greens and yummy stems too, so we put in loads of that. Plant more of what you love and vegetables that are expensive to buy like mangetout. Do you really need a whole packet of seed for everything. If you only need 5 tomato plants . buying a packet of seed means either keeping excess seeds for later years or sowing the whole lot and then having a whole bunch of baby tomato plants to repot and get rid of ( I never have the heart to just throw the excess away) Buy your plants from a local grower in your market or beg them from somebody who grows . They are usually happy to share . This goes for other veg such as cucumber, courgette and pumpkin. You can always buy more seed later. Don’t think that because you havent figured out the whole seasons planting you cant buy the seed yet. Get what you need to start and chill. Buy one packet of seed of something completely different you’ve never tried before. We tried some japanese greens last year yum! Cheap seed from Lidl or Aldi seems to work fine for some people . Thats where my parsley is from. I prefer for more important crops like tomato to spend a bit more on my seed. Find yourself a good local seedsuplier . I get most of my seed from Gardenworld in Ellen St Limerick. 061 414202, limerickgarden@eircom.net . They ordered my commercial seed for me and carry a good stock of Suttons, Thompson and Morgan, Suffolk and RHS seed. Keep records. I promise myself every year that I’ll keep a perfect record of everything I planted and when and how it performed. This year I’ll definitely do it. Have fun picking your seeds! I too love Chiltern Seeds and have bought all sorts of things from them over the years – both food plants and also plants simply to enjoy. For example I am growing a banana and a jasmine right now thanks to seeds from them. However one point I wanted to make in addition to your excellent article is something my girlfriend asked me about recently. And that is *organic* seeds. Just because you grow a plant organically, doesn’t necessarily make it organic if the seeds were not. I am now trying to consciously buy organic seeds wherever possible. 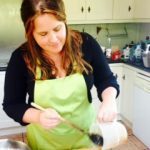 Could an article on suppliers of organic veggie seeds be considered here?